A is for Author and Animals. Author as, although I like writing poetry best, I also write stories, and Animals because I often put animals in my stories and poems, e.g. B is also for Brigg in Lincolnshire, where I was born and went to school, and Barker, for my surname before I married. C is for Causley and Cope – two of my favourite poets. D is for Devon where I live with my Devonian husband. Recently researching my family tree, I discovered that many of my ancestors came from Devon, too. Perhaps something in my blood drew me back to the county after living for 30 years in Staffordshire. E is for Education which I studied when I left school. 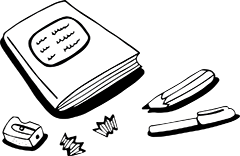 I now write lots of books for schools. You might find some of my story books among your class readers – some of them are BIG books! forgive if I get it wrong. I shall have to write in Sprong. we shall want to write “Dear fribble”. in Earth-years, I’d be eight. so we’re going to celebrate. with a hundred and twenty clabbits on top. I want to learn all about the Earth. Write and tell me all your gribble. and curly on my head. with the middle one black and white. can you really see all right? and a lovely pet splink called “Bloggs”. Is it true you have pets with four legs and a tail? What do you call them – droggs? that, today, I’ve written in Sprong. This is as true of developing writing talent as it is of learning a sport or a skill. The more you practise, the better you grow. I am never afraid to tweaking phrases, even weeks or years after first writing a poem, if it improves it. H is for Hard Work. People often ask, is it hard to write a poem? The answer is, it can be! 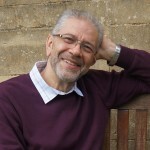 Very few poems come right straight away, most need drafting and rewriting. It can take a long time and a lot of effort – BUT I find it FUN working on a poem until I’m really pleased with it. It’s a bit like painting a picture and doing a jigsaw at the same time – solving a puzzle and gradually seeing the picture emerge. I find it helpful to keep reading poems aloud to hear how they’re coming along. I is for Imagination and Ideas which come in all shapes and sizes – and are full of surprises! Sometimes a few words pop into my head; sometimes I sit down to write on a subject or theme. Often, I see or hear something that sparks off an idea. Then my imagination does the rest. J is for January when I was born (brrrr!) or, much pleasanter, June, when my children were born. I have a son, Richard, and a daughter, Charlotte. K is for Kiddiwinks everywhere without whom there would be no-one to read my children’s books! L and M are for my Labrador, Matty (Matilda) the beloved family pet whose love and loyalty I and my family enjoyed as our children were growing up. I shall never forget her. N is for National Poetry Day and for Now. 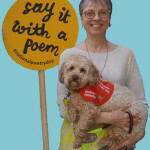 National Poetry Day falls each October, but you can make YOUR next Poetry Day NOW! Go on – read a poem; write a poem … NOW! Q is for Questions. Here are a couple of questions that I’m often asked. A: As soon as I’d learnt how to write. Before that I made them up in my head. Q: Can you can remember any poem you wrote when you were a child? I think they’re fab and love them all. R is for Rhymes. Not all my poems rhyme, but most do. Sometimes I try and stop them, but rhymes are wriggly things and usually find their way in. R is for Reading, too. The more you read, the better your writing becomes in my experience. S and T are for the Stockbridge Trail. 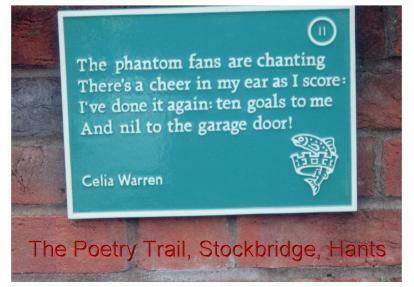 This is a poetry trail in Stockbridge, Hampshire. Ten poems were chosen from hundreds suggested by local residents. These are now on display along the main street, an old drove road running through the beautiful little town. Some are carved in stone; some engraved on glass; mine is cast in metal and sits proudly on the wall of the fire-station. U is for the Universe. There is no limit to what you can write a poem about – perhaps that’s why it’s called the uniVERSE! Makes my legs turn weak. And I took three bites from a celery stick. 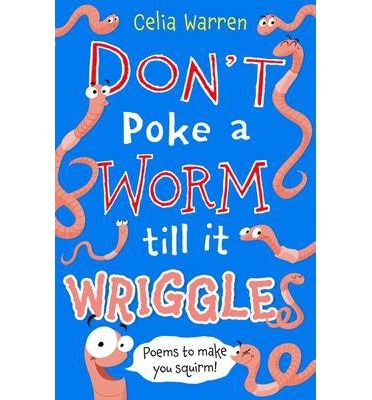 Worm poems by Celia Warren. W is for Worms. I have been collecting worm poems for years now and then I started writing my own. At last, they grew (as even small worms do) into a book that was published by Bloomsbury. It’s called Don’t Poke a Worm till it Wriggles. X is for an eXtra special occasion. That was when I met Gary Lineker at the launch of “More of Gary Lineker’s Favourite Football Stories”, published in 1998 by Macmillan. My story is at the beginning of the book. Have you read it? Z if for zzzzzzz …! 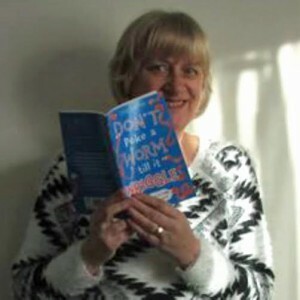 Click this link to buy Don’t Poke a Worm till it Wriggles or find out more.